'Tis the season for pumpkin. Pumpkin everything. Nope, it doesn't get old for me. My only pet peeve about pumpkin recipes is that only a portion of the can of pumpkin is used. Then, I have the remainder go to waste in my fridge. I figured not matter what, I was going to develop a pumpkin recipe using one whole can. Why not use it for waffles? I like to make a big batch of waffles, individually wrap them, and heat as needed for a breakfast on the go. I try my best to make my waffles as nutrient dense as possible. 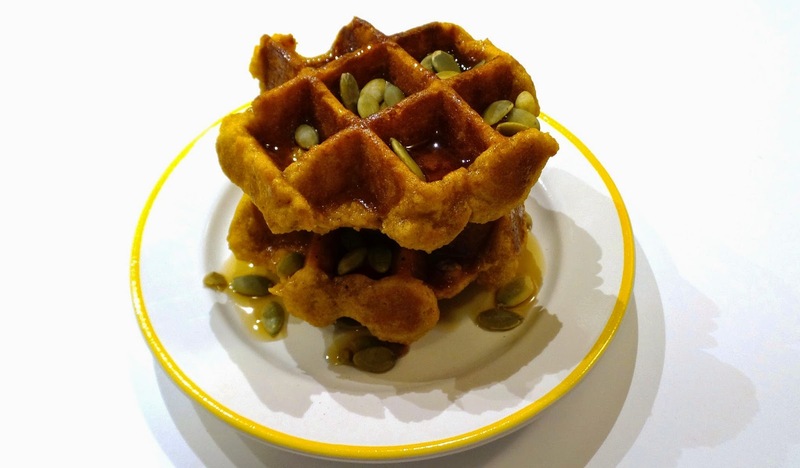 Almond flour works great in waffles. And separating the eggs, adding in whipped eggs whites makes for a fluffy texture. In a medium/large mixing bowl, whip the egg whites until stiff. Set aside. In another large mixing bowl, whip the egg yolks with the sugar until homogeneous. Add in the pumpkin puree, followed by the almond flour, AP GF flour, salt, and spices. Gently fold in the whipped egg whites in three increments. Have the waffle iron heated to medium, medium/high. Cook for a total of 6-7 minutes, maybe longer depending on size of waffles. Remove and allow to cool on rack. If storing in freezer - individually wrap in plastic wrap, and keep in freezer. To reheat, place in toaster (oven) on medium/high. Otherwise, serve with a sprinkling of pumpkin seeds and maple syrup. Feel free to add bacon as needed. This recipe make 16 small waffles. If using a large waffle iron, it could be as few as 12. Enjoy!